Former president of Catholic Relief Services (CRS) Ken Hackett will deliver the lecture “How Can a University Promote Integral Human Development?” at the University of Notre Dame’s Kellogg Institute for International Studies at 4 p.m. Nov. 15 (Thursday). The talk, which will be held in the Hesburgh Center Auditorium, is free and open to the public. Following Hackett’s address, Raymond Offenheiser, a 1971 Notre Dame graduate and president of Oxfam America, another highly respected development and relief agency, will offer commentary. “We are fortunate to have the remarkable opportunity to learn from the experience of leaders of two of the nation’s most thoughtful and effective development organizations,” said Paolo Carozza, director of the Kellogg Institute, which focuses its research and teaching on democratization and human development. CRS operates in more than 100 countries, with a global staff of nearly 5,000. Hackett led the agency from 1993 until stepping down late last year. He joined CRS in 1972, after a post-college stint as a Peace Corps volunteer in rural Ghana, and served in CRS posts throughout Africa and Asia, as well as at the organization’s Baltimore headquarters. Hackett was the 2012 recipient of the University’s Laetare Medal, the oldest and most prestigious honor given to American Catholics, as well as an honorary degree from Notre Dame. 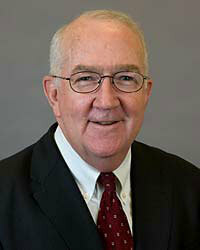 Most recently, Hackett has agreed to serve as an advisor to the Notre Dame Initiative for Global Development (NDIGD). His responsibilities will include working with NDIGD staff to grow and strengthen the initiative, advising on key development issues, and assisting the University in engaging in high-impact global development projects with partners worldwide. Offenheiser, an expert on issues such as poverty alleviation, human rights, foreign policy and international development, has led the Boston-based Oxfam America since 1995. He is a member of the Advisory Board of the Kellogg Institute. Originally published by Elizabeth Rankin at newsinfo.nd.edu on November 09, 2012.